Regardless of where you live, the places you visit frequently, or which media sources you tune into, there’s no denying that the kiosk and self-service solutions industry as a whole is rapidly expanding into new industries across the globe. 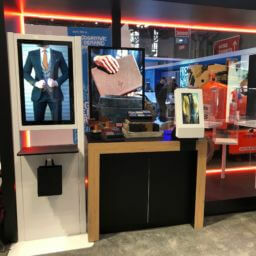 According to the 2019 Kiosk Marketplace Census Report, self-service kiosk sales grew more than 17.6 percent over the last calendar year, totaling a whopping $9.22 billion dollars in 2018. This isn’t the first year the industry has experienced significant growth like this, though. In fact, according to the report, the tremendous growth of the self-service industry in 2018 only slightly surpassed the growth that the industry saw in 2017. What’s causing all of this growth? The recently released report features more than 50 pages of charts, graphs, and insights from a variety of industry players and experts, all of which attribute the industry’s growth to a plethora of different factors. 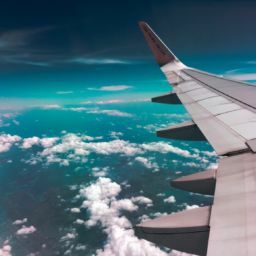 However, the promise of an improved overall customer perception and an increase in revenue as a result of reduced wait times, improved customer service, and sales and advertising support are among the most prominent. Cited at the top reason for deploying a kiosk, the majority of businesses implement kiosks with the customer in mind. With the ability to streamline processes, expand inventory offerings, improve accessibility, and expand a business’ reach, kiosks can be used to improve a customer’s experience, as a result, their overall perception of the company. Of those surveyed, reducing waiting lines was the #1 most important characteristic of self-service kiosks. Designed to streamline and automate processes that traditionally would have traditionally required a user to wait in line to enlist the help of an employee, self-service kiosks allow users to complete simple tasks on their own. While self-service kiosks directly expedite processes for those who choose to use them, they also indirectly benefit those who opt for a more traditional face-to-face experience with an employee by reducing the amount of individuals waiting in their lines. As tasks that would have previously been assigned to a sales associate—like the checkout process—are reassigned to a kiosk, businesses are able to reposition some employees to more customer-centric roles. This shift allows questions and concerns to be addressed in a more timely manner—effectively improving the quality of customer service offered as well as the level of customer satisfaction. 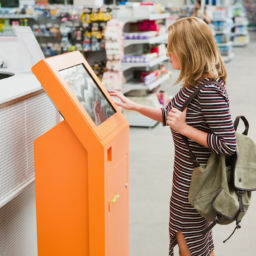 With the ability to promote and sell products and services on-screen through a website integration, endless aisle, or advertisements, self-service kiosks are an effective way to drive awareness and sales in-store without pulling sales associates away from their other roles. Similarly, businesses can generate additional revenue by selling advertising space on the kiosk’s attract loop for complementary products, businesses, and services. Kiosks and the self-service industry as a whole have boasted incredible growth over the course of the past decade, and that growth shows no sign of slowing down any time soon. In fact, as consumer perceptions and revenue growth continues to positively progress, one can expect to see the industry remain on its upward trend. 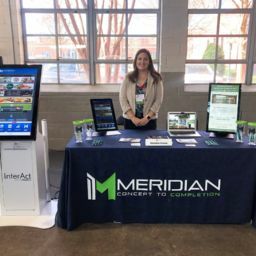 To learn more about our self-service solutions and the benefits they can offer, visit www.meridiankiosks.com or give us a call at 866-454-6757. At Meridian, we’re committed to developing innovative self-service solutions. Actually, we’re obsessed with it. We understand that emerging technologies can positively impact growth and efficiency in any business, and we work tirelessly to develop solutions that assist in that growth.